This will be a very quick post to ease me back into the process of blogging. The month we were in the States was delightful but hectic. More on that later. For now, I'll just congratulate Michael and myself for reaching June 14, 2009. 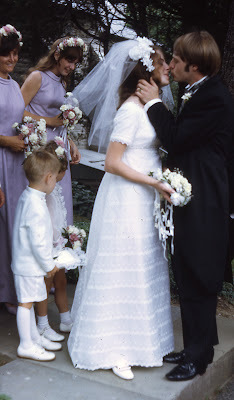 We were married on a stiflingly hot day in Rosemont, PA, forty years ago. Our recent week in California, culminating in the fabulous Outstanding in the Field dinner, a gift from Kate and my parents, was our anniversary treat, so today has been very relaxed. We slept late, read today's Observer, took a walk along the Thames, popped a bottle of Jacob's Creek Chardonnay Pinot Noir bubbly to wash down our crab and smoked fish.... Kate's lemon zest butter cookies are in the oven as I type, to accompany nectarine clementine sorbet and Michael's cardamom rice pudding, plus mango/pineapple/strawberry kebabs he'll barbecue before our lamb goes on the grill. The rest of the dinner is a snap, consisting as it does of salads bought at Waitrose after Friday's eye appointment (John Lewis, owner of my favorite supermarket, is very conveniently between Harley Street and the Bond Street tube station). And, of course, good bread, also from the Waitrose in John Lewis's basement. Wine will be a 2007 Craggy Range Pinot Noir from New Zealand's Te Muna Road vineyard. So there we are. Forty years. Who'd have thunk? Is that a picture of your wedding? What a lovely post! Congratulations on your anniversary, and wishes for many more happy years to come! Thank you, Paola. You'll notice I didn't post a photo 40 yrs on. . . .